Cauliflower is loaded with nutrients. It is a very good source of vitamin C and manganese. It has cancer fighting properties. It is low in fat, high in fiber and has antioxidant and anti-inflammatory properties. It strengthens the immune system and protects against cardiovascular diseases.So let us try to include this vegetable in our diet. Here is a simple Cauliflower rice recipe/Gobi rice. 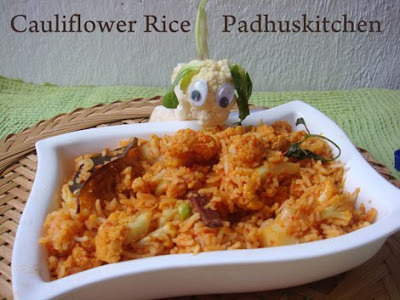 This is also ideal for lunch box, both kids and elders will love this rice. This is one of our family's favourite rice. Wash and soak basmati rice in water for 20 minutes. Drain the water completely, add 2 cups of hot water and pressure cook for 3 whistles or use the rice cooker for cooking rice. Finely chop onions, green chilli, ginger and garlic. Blanch the cauliflower florets. i.e.- Cut the cauliflower into florets and put them in boiling water to which a little salt and a pinch of turmeric powder is added. Let it remain in the water for 5 minutes. Then drain the water completely. If using fresh peas, par boil it with a little salt and keep it ready. If using frozen peas, just rinse it and use it. Heat 1 tbsp of oil in a pan and cook the cauliflowers adding half of the chilli powder. Do not overcook, as we want the cauliflower to retain its crunchiness. Keep it aside. Heat oil in a pan and add the ingredients mentioned under seasoning. Then add finely chopped onions and saute until it turns golden brown. Then add ginger, garlic, green chilli and saute for a few more minutes. Then add tomato puree, peas, turmeric powder, salt needed, remaining chilli powder, coriander powder, biryani masala powder and cook until the raw flavor goes and oil separates. Now add the cooked cauliflowers, cooked rice to the tomato gravy. Mix everything well and simmer for a few more seconds until everything gets blended well. Garnish with finely chopped coriander leaves and serve with chips or mixed vegetable raita or papads. Delicious and simple Cauliflower Pulao is ready. While buying cauliflowers, see to it that the florets are clean and white with bright green leaves. Looks for heavy and solid ones. Add a little lemon juice while blanching cauliflower to retain the white color. Love the doggie, very well presented dear. good one !the floret lamb is soooooo cute ! Yummy and delicious dish...cute cauliflower doggie. Love the cutie doggie..Gobi rice is delicious!! nice rice preparation.. love the cauliflower dog! So yummy and nice presentation..
How are you? Very nice recipe indeed. I will try soon. 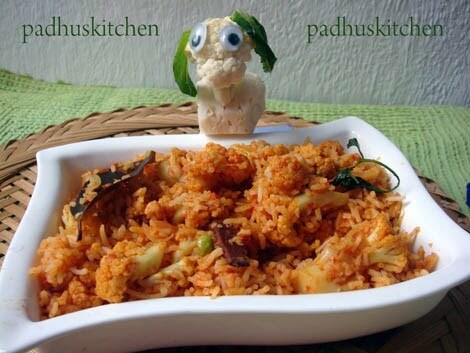 Love your version, very inviting colour & texture..
i just love this spicy gobi rice.easy to make for lunch. awesome click and nice presentation.keep going...... looking forward for more creative receipes. Love that puppy u have made out of cauliflower so cute. You can add biryani masala .I use Everest or even local brand like Shakti here. You can do that without that masala also but the taste will differ. I like this pulao with and without biryani masala. hi, tried this recipe and it turned out amazing. Thank you padhu mam. Sure i'll try this.. I just tried this recipe, it came out well but somewhere i feel like eating a tomato rice with a cauliflower in it :) Thanx for the recipe though. If you are using frozen peas, you can add after adding tomato puree. If using fresh peas, par boil peas a little and add after adding tomato paste. To cook the gobi, should I cover and cook? Kindly explain clearly at what stage should I switch off the flame whether it retain the crunchiness..
You can cook uncovered or covered.Cook on medium heat. Taste the cauliflower and check it. I have written it clearly as below "Cut the cauliflower into florets and put them in boiling water to which a little salt and a pinch of turmeric powder is added. Let it remain in the water for 5 minutes. Then drain the water completely." How many minutes does it take to cook brown rice in rice cooker padhu? Brown rice will take a longer time to get cooker. Timings differs according to the quality of rice. You can dry roast slightly, soak it and then cook. It will turn soft.